After watching the above video I had to write this post. Especially after just reading in Michael Moss’ book “Salt, Sugar, Fat” about how dairy has been subsidized by the government since 1930 which means they fix prices so that they won’t ever go too low if there’s too much supply which there has been for decades. So what have they done with the excess supply so prices won’t go too low? They buy it WITH TAX PAYER’S MONEY and then store it in caves. During the Reagan administration this all came to a halt because they were spending so much money on storage and the cheese was getting moldy. So they passed this Farm bill (http://futurefordairy.com/) which basically ensures that dairy farmers will never be subject to the same forces that the rest of the market is, that is supply and demand. Therefore, the government will NEVER tell you how bad dairy is for your health. In fact, they will always do the opposite in spite of the science such as The China Study, which showed that dairy protein, casein, causes cancer. And Jane Plant showed that her five-time recurring breast cancer was eliminated in six weeks by eliminating dairy after realizing that Asian women don’t consume dairy and they hardly ever get breast cancer. And, babies do NOT need dairy milk. Mother’s milk from HUMANS, yes, but not from cows. In fact, dairy has been implicated in SIDS (sudden infant death syndrome), allergies, ear infections, asthma, Type 1 and 2 diabetes and childhood obesity as well as in adults. Cheese has become the #1 food additive and it’s in everything now. And the saturated fat in cheese is the #1 source of fat in Amercan’s diets and the number one reason you are FAT, SICK and NEARLY DEAD. DITCH THE DAIRY. It makes your face break out in acne, gives you cellulite, beer bellies, under eye bags, menstrual cramps and makes your snore due to obstruction of airways due to mucous production. 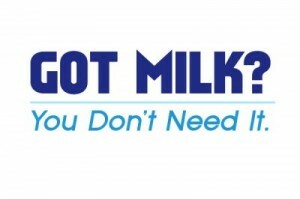 and visit websites like www.notmilk.com. It’s time people knew just HOW BAD dairy is for you. Try it for 90 days: ditch the dairy and see what happens. For Robyn O’Brien, her son had his lifelong rash under his arm pits clear up and his formerly somber personality perk up to a warm and affectionate one. He had the worst temper tantrum when he reintroduced it when visiting his grandmother’s house. And read the book “Salt, Sugar Fat” by Michael Moss and see how the information that you are getting from “reputable sources” are not trustworthy sources at all: there is a major conflict of interest with these sources that are masquerading as “neutral”.